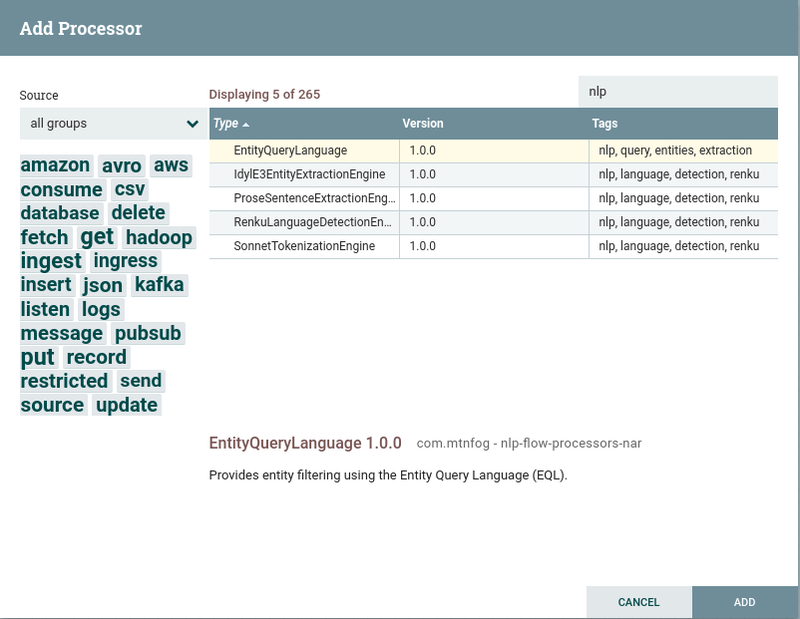 We have published a new open source project on GitHub that is an Apache NiFi processor that filters entities through an Entity Query Language (EQL) query. When used along with the Idyl E3 NiFi Processor you can perform entity filtering in a NiFi dataflow pipeline. select * from entities where text = "George Washington"
Entities matching the EQL query will be outputted from the processor as JSON. Entities not matching the EQL query will be dropped. With this capability we can create Apache NiFi dataflows that produce alerts when an entity matches a given set of conditions. Entities matching the EQL query can be published to an SQS queue, a Kafka stream, or any other NiFi processor. The Entity Query Language previously existed as a component of the EntityDB project. It is now its own project on GitHub and is licensed under the Apache Software License, 2.0. The project’s README.md contains more examples of how to construct EQL queries.